Former ICMSF member Dr. Bruce Tompkin and ICMSF Secretary Dr. Leon Gorris representing ICMSF at the Codex Committee on Food Hygiene, Chicago 13th to 17th November 2017. 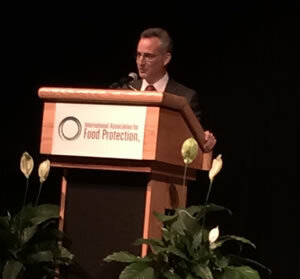 Dr. Jeff Farber’s presentation of the Ivan Parkin Award Lecture, during the opening session of the Annual Meeting of the International Association for Food Protection, held in St. Louis, Missouri, on July 31st, 2016. 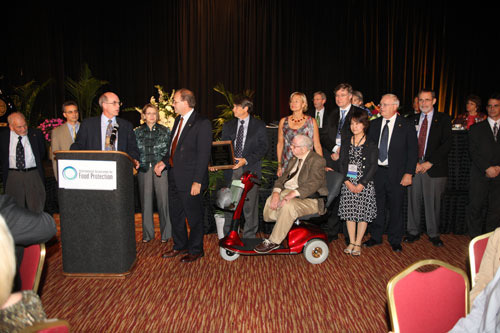 On August 6, 2008, the International Commission on Microbiological Specifications for Foods (ICMSF) received the 2008 Grocery Manufacturers Association (GMA) Food Safety Award at the annual meeting of the International Association for Food Protection (IAFP) in Columbus, Ohio. ICMSF Chairman Martin Cole, Ph.D., accepted the honor on behalf of the Commission, along with an impressive group of past and present ICMSF members who took the stage with him for the award presentation. The GMA Food Safety Award is awarded annually to individuals or organizations in recognition of a long history of outstanding and timely contributions to the global management of food safety issues. 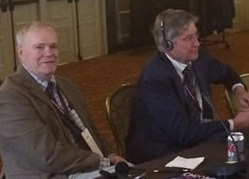 On behalf of ICMSF, Cole donated the $3,000 honorarium to the IAFP Foundation, which provides financial resources for encouraging development of food safety professionals, sharing and exchange of scientific information on food safety, enhancing food safety in developing nations around the world, and promoting food safety around the world.